I’ve worked as a virtual assistant in a few different capacities over the last four years and it’s been one of my favorite jobs. While I went the route of finding my own clients I know that everyone doesn’t want to do that. If you’ve been interested in becoming a virtual assistant and have past experience in administrative or similar work then getting a job through Time Etc. may be a good option. Here’s how to become a virtual assistant with Time Etc. When you work as a virtual assistant with Time Etc you’ll work with a number of clients and will perform many different duties. Some typical work you’ll be doing can include general admin, making schedule and/or travel arrangements, formatting documents, sorting expenses, making phone calls, social media, and possibly blogging or writing. With a wide variety of tasks and clients you’ll likely not get bored with the work from Time Etc. The only downside is that since there is such a wide array of tasks you could get stuck with things that aren’t always in the best alignment with your skillset. If this is up your alley you can put in an application with Time Etc. here. What Kind of Pay Can You Expect? Time Etc. provides all the clients to you as a virtual assistant. The starting pay is $11 per hour. It doesn’t appear that they guarantee you hours, though. They do offer flexible work so you can work for other companies too. If you’re looking for other ways to find virtual assistant jobs I highly recommend that you find clients yourself. While it’s nice to work for a company like Time Etc. that can provide clients for you, you’ll end up earning more money in the long run if you can do this for yourself. 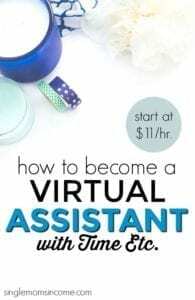 I recommend signing up for Gina Horkey’s free email course on Starting a Virtual Assistant Business if you want an insider look at it will take to get up and running. Thank you for this information. It is helpful. Good day,I have experience in administration and I would love to take up this job. Thank you for all the given tips. I hope I can also find a job from home. At last, I already made up my mind after 20 years, I am resigning from my job as office secretary next year!! I need to attend to my kids this time because my Mom is becoming sickly..